The draft master plan for Bengaluru is finally out. This important document will shape how the city will develop and function for next 15 years. A press note from Bengaluru Development Authority mentions that ecological sustainability, mobility, inclusive growth and streamlined governance are the four pillar stones of the Revised Master Plan (RMP) for Bengaluru 2031 (Draft). The GoK approved the RMP Draft for a Local Planning Area covering 1206.97 sqkm and an estimated population of 18-20 million. The draft Master Plan is available on the website of the Authority and also put on display the Proposed Land Use Maps – 2031 for public suggestions/ objections, at 1st Floor, Banashankari BDA Shopping Complex, BSK-II, Bengaluru -70 during office hours. 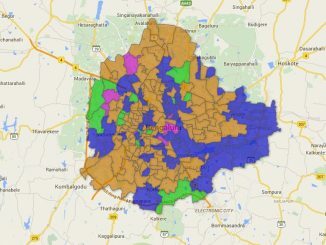 The BDA has revised the Master Plan for Bengaluru for 2031 as a spatial-policy framework adhering to the aspirations of the citizens flagged during public consultations, through, planning strategies and regulations focussing on balancing the city growth in terms of optimal and efficient utilization of land through efficient public transportation system and preserving the lake valley system and creating large lung spaces. 1. The Authority has envisaged Planning Zone A (areas falling within the Outer Ring Road) as stabilisation zone discouraging further commercialization and densification; Planning Zone B (areas falling outside the ORR and up to the Conurbation Limit of RMP 2031)as consolidation zone supported with upgraded infrastructure and network connectivity; and Planning Zone C (areas beyond the conurbation limit and up to the Boundary of LPA) as a preservation zone with productive landscape and improved economic returns for the farmers. 2. RMP-2031 has planned for 8 regional parks measuring 40 Ha to 200Ha across of LPA of BDA. Efforts have been made to utilise mining/ quarry areas to be developed as green spaces and protection of valley system. 3. RMP- 2031 has proposed to develop 4 sports complexesfor the city. 4. The supply of affordable housing targeted through a multi-pronged strategy of creation of land bank through mandatory provisions for earmarking land in the layouts and use of government lands and mandatory provision for built affordable housing as part of development permissions. 5. RMP-2031 for the first time has classified the streams into primary, secondary and tertiary based on the Flood Modelling carried out in association with Karnataka State Natural Disaster Monitoring Centre, Bangalore and demarcated buffers for the lakes and streams as per the orders of the Hon’ble National Green Tribunal. 6. RMP -2031 has, for the first time, delineated 12 heritage zones for which special regulations have been included in Zoning Regulations. 7. Master Plan coordination and monitoring committee IS proposed for implementation of plan proposals. 8. The mixed land use strategy has been relooked at and a controlled approach using the space standards and road widths has been proposed to limit the intrusion of commercial activities in pure residential areas. 9. The spatial distribution of land for economic nodes/centres, public-semi-public and greens. Integration of land use transport with consideration for road hierarchy and public transport. 10. The increase in conurbation IS limited to about 80 Sq.km. which includes Yelahanka Air-force Station, Defence Areas, water bodies, forests, mines/ quarries, gramthanas, etc. The Increase is from 804 Sq.km. (RMP 2015) to 884 Sq.km. with agross density of about 210 PPH, in view of the large tracts of vacant land available under the existing conurbation limits and the strategy for compact high density developments supported with targeted shift of public transport share from existing 48 percent to 68-70 percent. 11. Regulations to support development of buffers and regional level green facilities strategized through incorporation of buffers as part of mandatory greens in the development plans and evolving innovative financing mechanisms like TDR for procurement of land for these green spaces. 12. Provisions related to rain water harvesting, solar water heating and lighting for large scale developments, institutional and commercial buildings, norms for tree plantation have been introduced/ amended. 13. 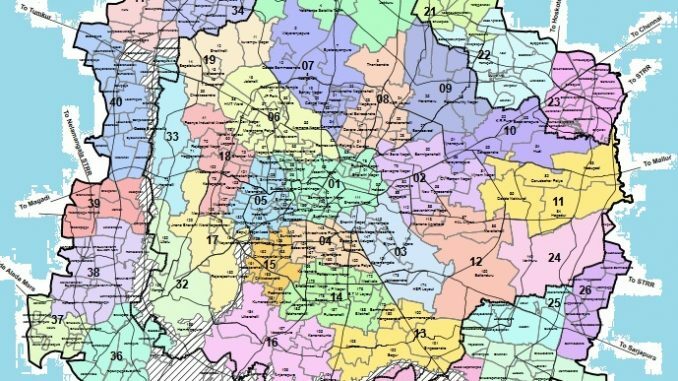 RMP-2031 has proposed 5 Special Development Zones along the natural corridors of growth. The Special Development Zones have been envisaged as High Density Integrated Developments providing employment opportunities supported with the necessary residential and amenity requirements. The road network in these special development zones have accordingly been proposed to accommodate high density developments with strong public transport system connectivity. 14. RMP 2031 has proposed 5 Rings and 26 radials to create a network of Major Arterial Roads considering the road hierarchy with regard to the envisaged density patterns. 15. RMP-2031 has proposed Mass Transport Corridors which includes creation of additional metro network along ORR and PRR, development of Mono Rail/ Light Rail/ BRTS. 16. Truck terminals and ISBTs/ TTMCs have been proposed along the major corridors and land has been accordingly allocated. 17. The Traffic Impact Assessment for large scale developments made mandatory. 18. Land has been identified and earmarked for various infrastructure and utilities like Water Supply, SIPs, Electric Sub-stations, Solid Waste Management, Fire Stations, etc. 19. Special Guidelines/ Regulations have been introduced for Integrated Economic Townships (Above 25 Ha) and Integrated DPs to encourage the concept of walk to work and compact high density developments with higher FARs introduced. Find all the files related to Revised Master Plan-2031, on Opencity.in. Comments or suggestions should be submitted through this form. You can attach separate sheets if necessary. In case of objections / Suggestion pertaining to RMP – 2031 shall be accompanied by supporting/authenticated records including maps otherwise it may not be possible to consider objection. Hand over the completed form in Room No.210, 2nd Floor, BDA Commercial Complex, Banashankari, Bangalore-70 to get an acknowledgement during office hours or can be Emailed at: suggestions.rmp2031@gmail.com. Objection / suggestions will be received from 25-11-2017 to 23-01-2018 only, and the objection/suggestions received later will not be considered. All the objections/suggestions by post shall be sent through RPAD only, says the information on BDA website. As private companies are increasingly using Aadhaar data, is the privacy and security of personal data really at risk? What do those defending Aadhaar have to say? Citizen Action Forum (CAF) suggests remedial measures that will decongest Bengaluru’s Airport Road, without going for steel flyover. As Mr Suraj has rightly said bringing down the FAR to 1.5 is of no use, instead increase in FAR upto 2.5-3 to all smaller dimension sites upto 2400 sft is worth spending money on the construction.The high cost of sites have deprived the natives of Bangalore to own individual sites instead the family can build some flats of their own and live happily . The reduction of FAR to 1.5 doesnt make any sense as the land cost is high and many people will build the buildings in violation of the FAR which become AKRAMA building. BDA should allow vertical growth than reducing the FAR to 1.5 I have a 30*45 site and as per the setback of leaving 2 meters on left, right and rear, I cannot construct a meaningful building. Ideally 5% setback on overall sides is best option as the land is too costly in the core areas. Its better to have the ratios to the depth and width of the site as in RMP 2015.